This is by far the hardest book to read that I’ve written. I got a lot of complaining letters from readers expecting a rip-snorting follow-up to Gates of Fire. The greatest armada ever assembled up to that time, the Athenian fleet that launched against Sicily in 415 BC, was destroyed in its entirety at the battle of Syracuse two years later. 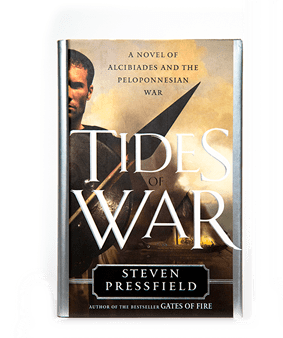 The hero of Tides of War is the real-life Athenian general, lover, and all-around Most Notorious Renegade Of All Time, Alcibiades. As a fighting commander on land and sea, Alcibiades was never defeated. Yet his city, Athens, condemned him to death not once but twice. The first time he defected to Athens’ arch-enemy Sparta, where he became “more Spartan than the Spartans” and contributed to the most calamitous military defeat in Athenian history, at Syracuse in Sicily. The second time he defected to Persia, Athens’ other great enemy, where he became “more Persian than the Persians” and again pushed his homeland to the brink. He returned to Athens, took over command and led his countrymen to victory after victory, until they rejected him again. Athens lost. Sparta won. Alcibiades, on the run in Asia Minor, was hunted down and assassinated by a party of Spartans and Persian mercenaries. He was the last man alive whom the conquerors still feared. Available in hardcover, paperback, audio and e-book from Amazon, B&N, and indiebound. The course's five audio lessons will ground you in the principles and characteristics of the artist's inner battle. Continue each week (also free) with our "Writing Wednesdays" and "What It Takes" posts, each one like a new chapter in The War of Art. Plus continual videos, freebies, specials and new material throughout the year.